Availability of reliable data such as water levels and rainfall coupled with inflow forecasts for existing/on-going projects in the basin is essential for taking right decisions on water management, for optimum utilization of water resources. It was in this context that Narmada Water Disputes Tribunal (NWDT) directed that, "---- stream and other gauging stations equipped with automatic recorders, wherever necessary, discharge, silt, and evaporation observation stations and measuring devices be installed, maintained and operated in the Narmada basin". The present conventional method of manual data observations and transmission results in a considerable time lag between data observation in field and its receipt at decision-making level which sometimes leaves very little time for issue of flood forecast and taking remedial measures for the dam safety and also evacuation of population in the downstream flood zone. The planned computerized network operating in real time environment and free from such snags will improve efficacy, accuracy and also warning time round the year for efficient integrated reservoir operation, dam safety and the flood management. To comply with the directives of NWDT, Narmada Control Authority has set up a high-tech Real Time Data Acquisition System in Narmada basin, which is in monsoon, 2007. Automated real-time data communication through Data Relay Transponder (DRT) on board KALPANA-I under interrogation-answer back protocol’ at a pre-programmed interval of 15 minutes. Transfer of e-mail among projects and key stations within the network. Flood forecast / lean flow assessment for four projects. Water level forecast at two locations in Madhya Pradesh. Creation & maintenance of user-friendly hydro-meteorological database for the basin. 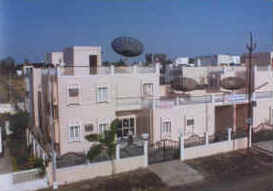 Master control centre at Indore uses a 3.6 metre dish antenna with INSAT earth station system and GPS time code receiver for communication control of data and e-mail transfer as well as time synchronization of the network (block diagram of MCC is given at Plate-III). The data collected at remote stations is transmitted on real-time mode over WAN to a Pentium server and associated work stations installed in MCC. Appropriate application software viz. Datawise and HEC-DSS for validation & analysis of hydromet data, maintaining the archive, Water Management Software viz Sacramento Soil Moisture Account (SSMA), Channel Routing Model & HEC5 shall be used to fulfill different objectives.